2019 - (21 March) World Poetry Day Reading for Christchurch as part of Thursdays-in-Black, with Jack Ross, Bryan Walpert, Hannah August, Rand Hazou et al. MC: Penny Lyall. 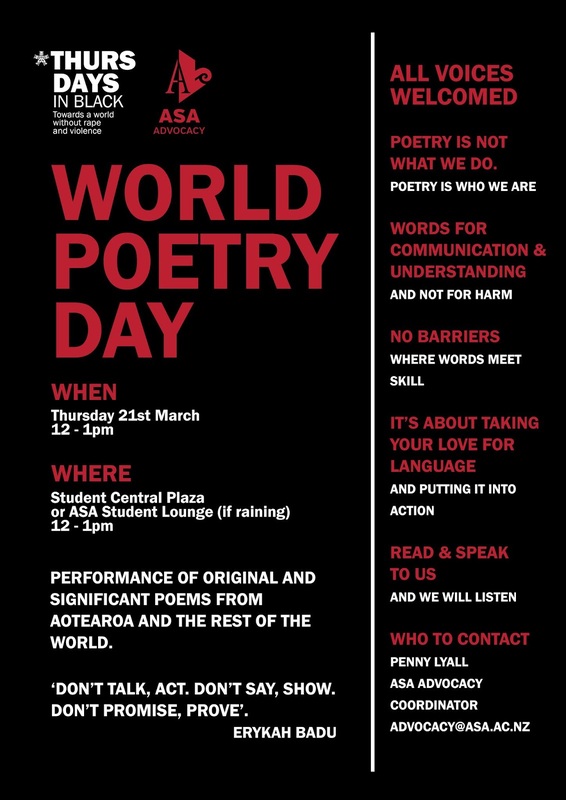 Venue: Student Central, East Precinct, Albany Campus, Massey University. 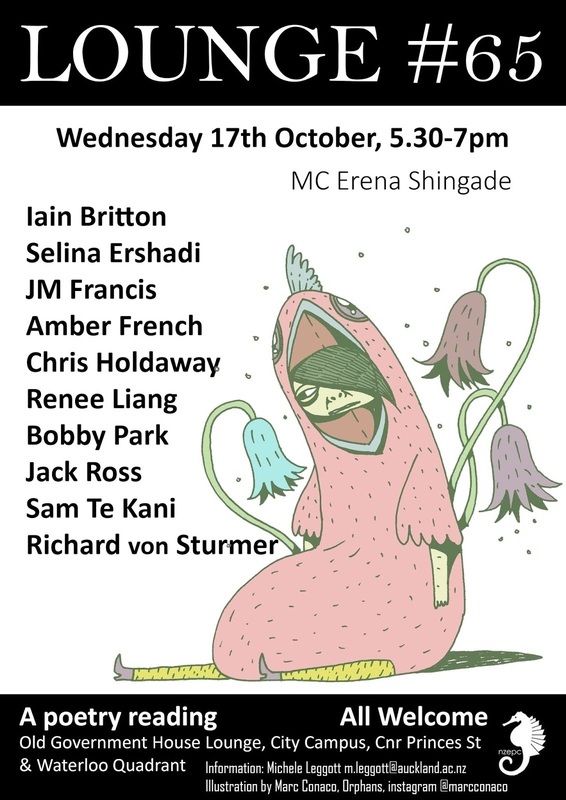 2018 - (17 October) Reading at Lounge #65, Iain Britton, Selina Ershadi, J M Francis, Amber French, Chris Holdaway, Renee Liang, Bobby Park, Jack Ross, Sam Te Kani, and Richard von Sturmer. MC: Erena Shingade. Venue: Old Government House Lounge, Cnr Princes St and Waterloo Quadrant, Auckland Central (in University of Auckland grounds). 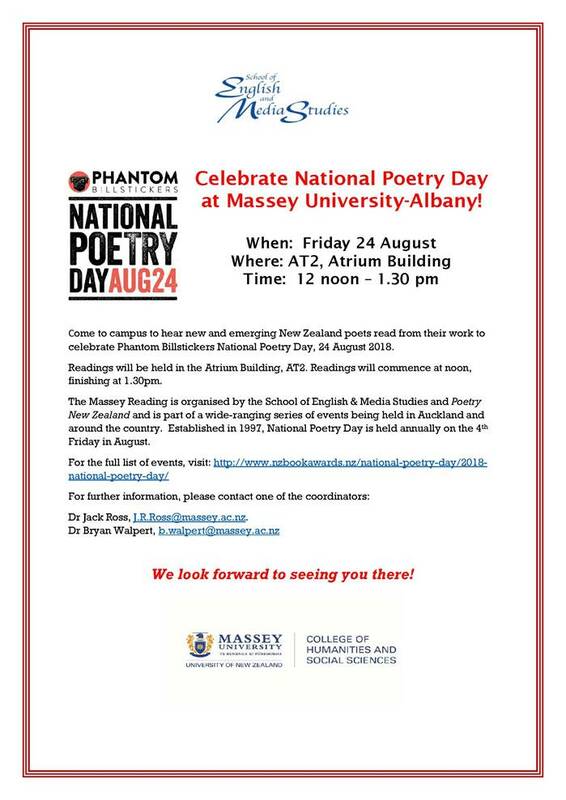 2018 - (24 August) Read in the National Poetry Day reading at Massey University's Albany campus, together with David Howard, Jason Tunui, Shelley Arlidge, Margaret Moores, April-Rose Geers, Jack Ross, Emma Harris, Alex Tunui, Bryan Walpert & Devon Webb. MCs: Jack Ross & Bryan Walpert. 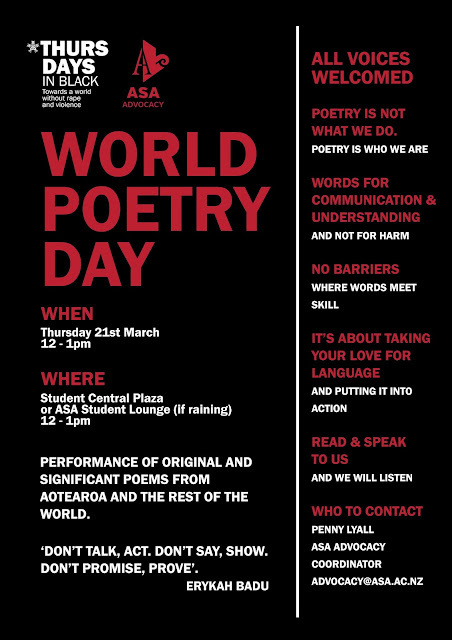 Venue: AT2, Atrium Building, Albany Campus, Massey University. 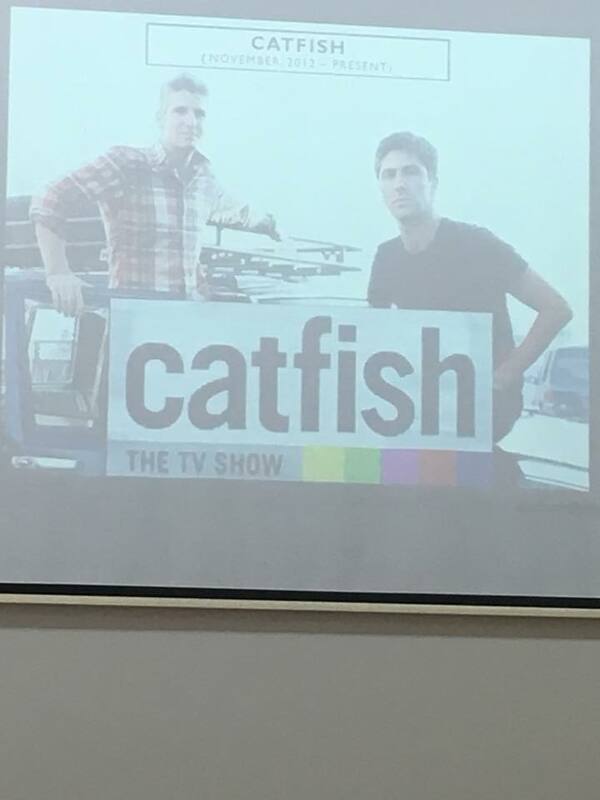 Time: 12-1.30 pm. 2018 - (28 June) Gave a short story reading in the second session of the 15th International Conference on the Short Story in English: “Beyond History: The Radiance of the Short Story," with Chair Diana V. Almeida and co-readers Laila Stien & Russ Soh (Universidade de Lisboa, Portugal, 27-30 June 2018). 2018 - (31 May) Can poetry save the Earth? 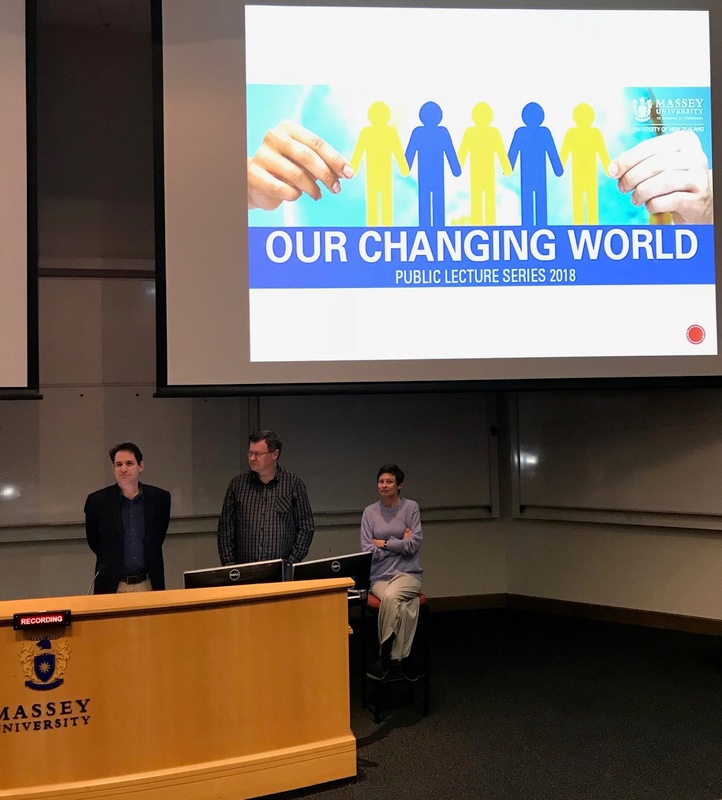 : Thursday 31 May 2018 | Associate Professor Bryan Walpert, Dr Jack Ross, Dr Jo Emeney: Can Poetry Save the Earth? 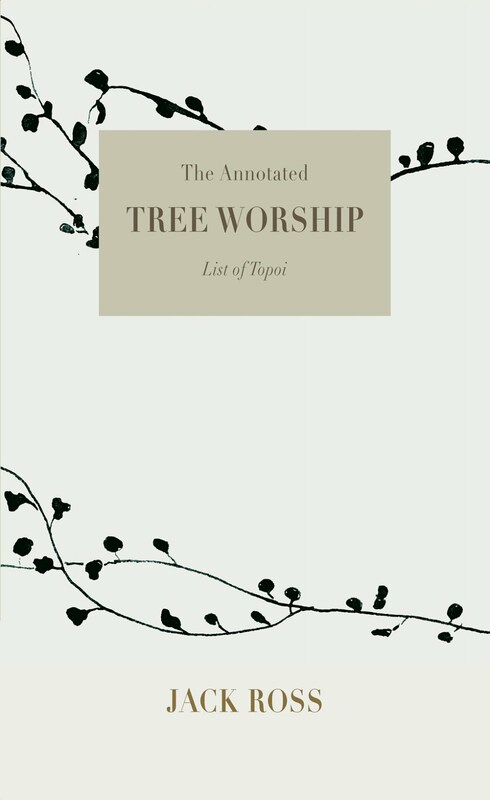 A Field Guide to Nature Poems is the title of poet and critic John Felstiner's 2009 exploration of how the human and natural worlds connect. Can writing and reading poetry change both? It’s a question that resonates with one of the most pressing issues of our time – the impact of climate change. Poets and editors Associate Professor Bryan Walpert, Dr Jack Ross and Dr Jo Emeney, from Massey’s creative writing programme, discuss how imagination and thinking about nature can be opened up through poetry and will read from their own work, at Sir Neil Waters Lecture Theatre Building (SNW300), Massey University, Auckland campus (6.00-7.30 pm). 2016 - (14 December) Poetry in Translation: Poetry readings in and from Greek, Italian, Māori, Fijian, Norwegian, Sāmoan and French by Vana Manasiadis, Paula Green, Hemi Kelly, Makyla Curtis, Tulia Thompson, Siobhan Harvey, Doug Poole and Jack Ross at this event organised by Seraph Press to celebrate the launch of the first two chapbooks in their new Translation Series, with MC Helen Rickerby, at St Paul St Gallery, 40 St Paul Street, Auckland Central (behind AUT) (6.00-8.00 pm). 2016 - (16 September) Gave a poetry reading in the concluding festival event of Poetry on the Move: Poetry Adventures on and off the page, with Merlinda Bobis, Michelle Cahill & Simon Armitage - "Ahead of the announcement of Vice-Chancellor’s International Poetry Prize, head judge Simon Armitage is joined by the three longlist judges reading from their own work." (A two-week festival of poetry, organised by the International Poetry Studies Institute (IPSI) in the Faculty of Arts and Design at the University of Canberra, 6-16 September 2016). 2016 - (10 September) Titirangi Poets: Our featured poets on Saturday 10th September at 2 pm at Titirangi Library are Jack Ross and Stu Bagby, both well known and admired poets, with MC Piers Davies, at Titirangi Library (2.00-3.45 pm). 2016 - (30 August) Celebrating Poetry: Come and join us as at our annual celebration of poetry with readings from Michael Giacon, Joy MacKenzie, Bronwyn Lloyd, Jack Ross and Stu Bagby as our MC, at Takapuna Library (6.00-7.30 pm). 2016 - (13 July) Gave a short story reading in the first session of the 14th International Conference on the Short Story in English: “Influence and Confluence in the Short Story: East and West," with Presenter Bronwyn Lloyd and co-reader Yiyun Li (East China Normal University, Shanghai, China, 13-16 July 2016). 2015 - (20 November) "Keeping it in the Family:" reading / presentation as part of the Blikfang Events series, at Blikfang Gallery, 130 Queen St, Northcote (from 6.00 pm). 2015 - (28 August) Divine Muses Poetry Reading XII: MC'ed by Siobhan Harvey, with poet and National Poetry Day Coordinator, Miriam Barr; respected poet and children’s author, Maris O’Rourke; poet, creative writing teacher and Poetry New Zealand editor, Jack Ross; internationally celebrated poet, Tusiata Avia; prolific poet, editor, and nonfiction author, Harry Ricketts, at Gus Fisher Gallery, Auckland Central (6.30-8.00 pm). 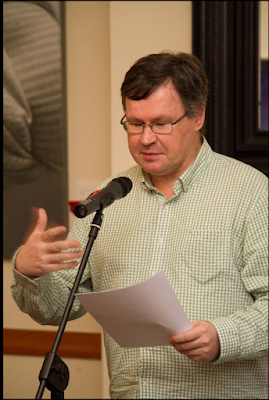 2015 - (27 August) Hamilton Book Month Poetry Reading: MC'ed by Mark Houlahan, at Creative Waikato Big Space, 131 Alexandra St, Hamilton (from 6.00 pm). 2015 - (14 August) The Human Condition: Poetry Reading with Iain Britton, Makyla Curtis, Michele Leggott, Jack Ross and Lisa Samuels at Time Out Bookstore, Mt Eden Village (7.00-8.30 pm). 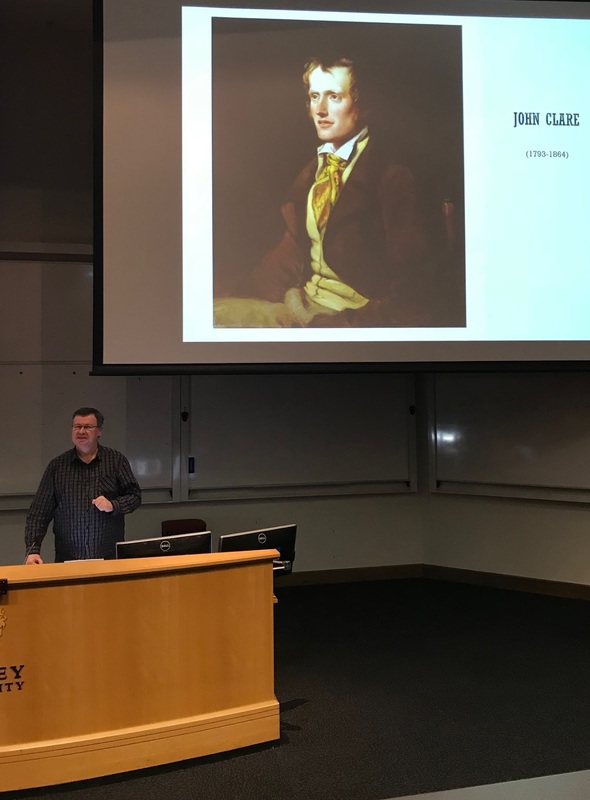 2015 - (25 May) Tracey Slaughter launches A Clearer View of the Hinterland (Wellington: Headwork) and Jack Ross launches The Longest Drink in Town (MC: Mark Houlahan) at the Art Fusion Gallery, Waikato University. 2015 - (14 February) Took part in When Love Comes to Town: a St. Valentine's Day Poetry Reading MC'ed by David Howard, with Michele Leggott, Jack Ross & Fredrika van Elburg, at The Pah Homestead, TSB Wallace Arts Centre, 72 Hillsborough Rd, Hillsborough, Auckland. 2014 - (26 November) Took part in Truth or Beauty: Poetry and Biography conference public poetry reading: MC'ed by Helen Rickerby, with trans-Tasman poets including: Jordie Albiston (Aus), Amy Brown (Aus/NZ), Toby Davidson (Aus), Joan Fleming (Aus/NZ), Anna Jackson (NZ), Harry Ricketts (NZ), Jack Ross (NZ), Erin Scudder (Aus/NZ), Robert Sullivan (NZ), and Jessica Wilkinson (Aus) at Meow Cafe, 9 Edward Street, Wellington. 2014 - (13 September) Guest poet, with Richard Taylor, & MC Ron Riddell, at The Titirangi Poets, Titirangi Library (alternate Saturdays 2pm – 4pm). 2014 - (22 August) POETRY CENTRAL 2014, at Auckland Central City Library, 5.30-7 pm, celebrating National Poetry Day, as well as the 13th birthday of the nzepc, with readings by John Newton, Ya-Wen Ho, Robert Sullivan, Makyla Curtis, Jack Ross, Alice Miller, Murray Edmond, & Selina Tusitala Marsh, with MC Michele Leggott. 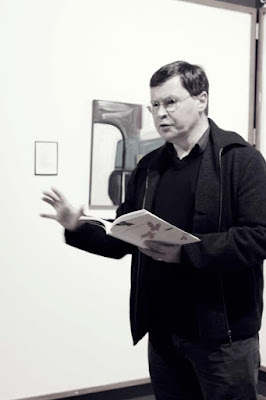 2014 - (7 June) Guest poet (with Stu Bagby, musician Brian Cavanagh and open mic MC Laura Giddey) at Spread the Word @ MAC #2: a poetry reading at the Mairangi Art Centre, organised by Gus Simonovic of Printable Reality. 2014 - (10 April) Took part in Michele Leggott - A Celebration: a poetry reading to recognise Michele Leggott's achievement in winning the 2013 NZ Prime Minister's Award for Literary Achievement in Poetry, as well as celebrating the release of her latest work: with Stu Bagby (MC) and readers Jack Ross, Siobhan Harvey, Iain Sharp, Bronwyn Lloyd & C. K. Stead, at Takapuna Public Library. 2014 - (13 February) MC'ed and took part in an Open Mike Reading at the Professing Creativity Conference at Massey's Wellington Campus. 2013 - (3 November) Took part in Hawke's Bay Poetry Conference plenary poetry reading four: with Maris O’Rourke (chair) and readers / performers: Tim Jones (Wellington), Janis Freegard (Wellington), Husayn Rawlings (Southland), Mere Taito (Hamilton), Jack Ross (Auckland), Charlotte Simmonds (Wellington), Deirdre Thorsen-Lavery (Hawke’s Bay), Gill Ward (Kapiti), Tricia Lambert (Wairoa), Barry Smith (Hamilton), Dorothy Wharehoka (Hawke’s Bay) and Niel Wright (Wellington) at Havelock North Community Centre, Hawke's Bay, 1-3 November. 2013 - (16 August) POETRY CENTRAL 2013, at Auckland Central City Library, 5.30-7 pm, celebrating National Poetry Day, as well as the 12th birthday of the nzepc, with readings by Ian Wedde, Anne Kennedy, Murray Edmond, Lisa Samuels, Robert Sullivan, Janet Charman, Jack Ross, & MC Michele Leggott. 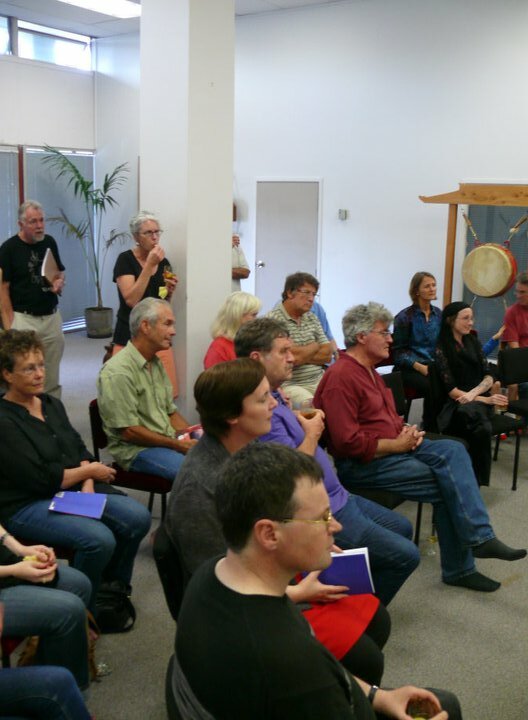 2013 - (1 August) Took part in Writers without Borders event at Te Whare, Gallagher Academy of Performing Arts at the University of Waikato. MC'ed by Tracey Slaughter, it featured brief readings by each of the participants: Lynn Z. Bloom, Catharine Chidgey and Jack Ross, and then a lounge-style discussion on their current work. 2013 - (18 May) MC'ed and organised Massey University Open Day poetry reading, with Elizabeth Morton, Steven Toussaint and Richard von Sturmer, in the Drama Lab, Sir Neil Waters Building, Main Campus, Albany. 2013 - (17 April) Reading at Lounge #31, Iain Britton, Alex Jespersen, Mike Johnson, Hilary Johnston, Ann Jones, Liz Lang-Brown, Therese Lloyd, Matt Metzler, Lorenz Poeschl, and Jack Ross. MC: Michele Leggott. Venue: Old Government House Lounge, Cnr Princes St and Waterloo Quadrant, Auckland Central (in University of Auckland grounds). 2012 - (25 November) Michele Leggott launches Celanie: Poems & Drawings after Paul Celan (Auckland: Pania Press) in the garden of 6 Hastings Rd, Mairangi Bay. 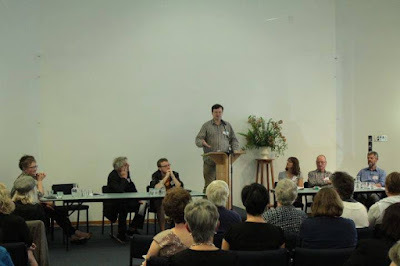 2012 - (10 November) Talk on writing a novel, and reading from Tree Worship at the North Shore Writers’ Group in the Belmont Rose Centre. 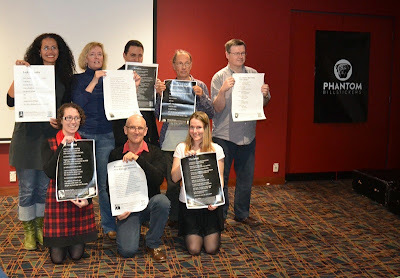 2012 - (1 November) Rhythm & Verse Reading, with poets James Crompton, Penny Somerville, Maris O’Rourke, Jack Ross, & musicians John Goudge & Cat Tunks – with MC Ila Selwyn, at Black Salt Bar and Eatery, New Lynn. 2012 - (27 July) Friends of the Takapuna Library National Poetry Day Reading, with poets John Adams, Raewyn Alexander, Stu Bagby, Stephanie Johnson, and Jack Ross, from 6 p.m.
2012 - (27 July) East Coast Bays Library National Poetry Day Reading, with Stu Bagby, Jack Ross, and an open mike session, from 10 a.m.
2012 - (12 July) Poetry reading, with Riemke Ensing, Sarah Broom, Nicholas Reid, Charles Hadfield, and Siobhan Harvey, at the opening of the Korero exhibition. Venue: Uxbridge Art Centre, Howick. 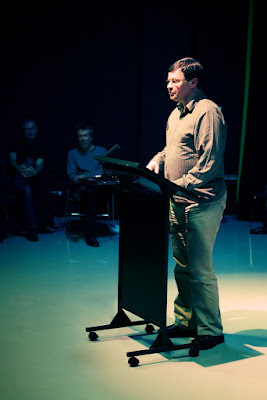 2012 - (1 July) Open Mike Reading at the Massey Masters in Creative Writing contact course, Drama Lab, Massey Palmerston North, with Thom Conroy, Ingrid Horrocks, and Bryan Walpert, together with students Bonnie Etherington, Cassy Green, Peter Howland, and Annabel Wilson. 2012 - (28 March) Reading at Lounge #24, Rachel Blau DuPlessis, Pam Brown, Martin Harrison, Dinah Hawken, David Howard, Jill Jones, Cilla McQueen, Jack Ross, Susan Schultz, Hazel Smith, Robert Sullivan and John Tranter. MC: Michele Leggott. Venue: Old Government House Lounge, Cnr Princes St and Waterloo Quadrant, Auckland Central (in University of Auckland grounds). 2011 - (29 July) Late National Poetry Day event with MC Ila Selwyn; poets Bob Orr, Penny Somervaille, Jack Ross, Michele Leggott, Robert Sullivan, Alice Hooton, Denys Trussell, Rosetta Allan, Murray Edmond, Judith McNeil, John Pule, Siobhan Harvey & Alistair Paterson; & musicians Nigel Gavin & Chris O'Connor, at Lopdell House Gallery, Titirangi, West Auckland. 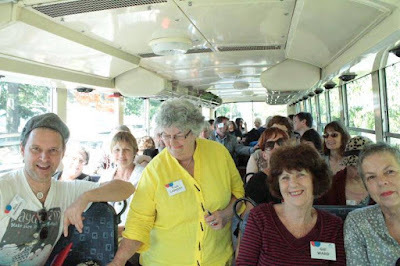 2011 - (22 July) Friends of the Takapuna Library National Poetry Day Reading, including North Shore poets Stu Bagby, Jack Ross, Donna A’Court, Sonia Yelich, and Alice Hooton. 2011 - (8 July) Recorded Lounge Room Tribalism in the Carlton Gardens, Melbourne, as a part of Michele Leggott's visual poetry project periphery, at the Poetry & the Contemporary Symposium (Melbourne: Deakin University, 7-10 July). 2011 - (28 June) Guest poet at Poetry Live, Thirsty Dog, 469 Karangahape Road, Auckland Central. 2011 - (25 March) Reading with Jenny Harrison and Robert Bolton at Whangaparaoa Public Library, as part of writers’ read-in: A Christchurch fund-raiser. "Come hear some of Auckland's most acclaimed authors read from their published works. Proceeds go directly to the New Zealand Government Christchurch Earthquake Appeal. 140 writers will be reading at 32 libraries, all on the same day, some at 1 pm and some at 6 pm." 2011 - (19 January) Reading at launch of brief 41, edited by Richard von Sturmer, with Iain Britton, Wystan Curnow, John Geraets, Scott Hamilton, Dale Johnson, Zarah McGunnigle, Michael Morrissey, Manon Revuelta, Lisa Samuels & Richard Taylor, at the Zen Centre, 15 Church St., Onehunga. 2010 - (17 November) Joint launch of Kendrick Smithyman's Private Bestiary: Selected Unpublished Poems, 1944-1993, edited by Scott Hamilton (Titus Books) and Campana to Montale: Versions from Italian, edited by Jack Ross & Marco Sonzogni (Edizioni Joker), with speeches, readings, and performances by Bill Direen, Scott Hamilton, Jack Ross, Peter Simpson and Yvonne Sutherland, at Old Government House, Auckland University. 2010 - (16 November) Judge (with Jo Emeney) of second $2500 Kathleen Grattan Award for a Sequence of Poems at the International Writers’ Workshop, Northcote. 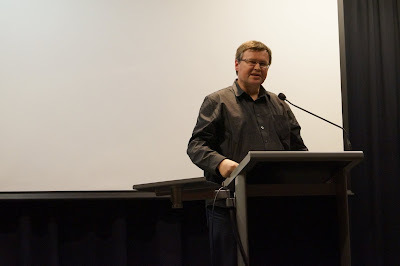 2010 - (13 November) Talk on translating Paul Celan, and reading from Celanie at the North Shore Writers’ Group in the Belmont Rose Centre. 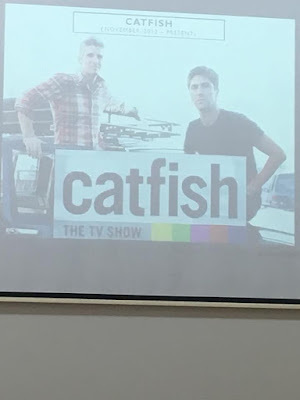 2010 - (23 September) Bronwyn Lloyd launches Kingdom of Alt, with a reading by Jack Ross, together with The Constant Losers, by Alex Wild [Jespersen]. Titus Books Dual Book Launch at the Alleluya Café, St Kevin’s Arcade, Karangahape Rd. 2010 - (17 September) Five-minute Poetry presentation, with Sarah Broom, Janet Charman, Murray Edmond, Anna Jackson, Michele Leggott, Selina Tusitala Marsh, Robert Sullivan, Albert Wendt, & Sonja Yelich, at the launch of 99 Ways into NZ Poetry, by Paula Green & Harry Ricketts (Auckland Central Library). 2010 - (2 September) Reading at Home & Away Trans Tasman Poetry Symposium, with Michelle Cahill, Jen Crawford, Brian Flaherty, Martin Harrison, Jill Jones, Michele Leggott, Kate Lilley, John Newton, Chris Price, Nigel Roberts, Helen Sword, John Tranter and Adrian Wiggins. MC Ken Bolton (Sydney, UTS Broadway Campus). 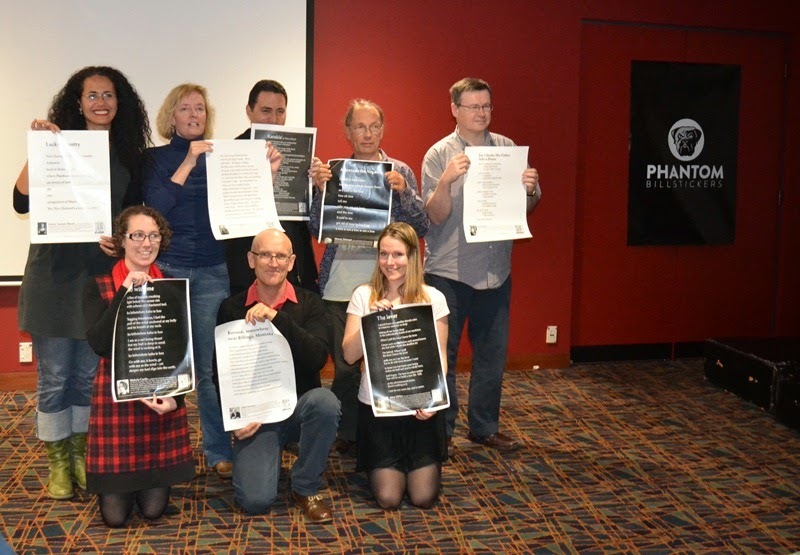 2010 - (28 April) Reading Cilla McQueen's "Anthem", at Lounge #13, with Ben Brown, Martin Edmond, Paula Green, Greg Kan, Jordan Luck, Zarah Butcher McGunnigle, Selina Tusitala Marsh, Otis Mace, Sacha Norrie, Stephen Oliver, and US Consul General, Randy Berry helping the Phantom Billstickers launch 10 new poetry posters. MC: Michele Leggott, at Old Government House, Auckland University. 2010 - (31 March) Poetry reading to celebrate the publication of Wildes Licht: Poems / Gedichte aus Aotearoa Neuseeland, edited & translated by Dieter Riemenschneider (Kronberg: Tranzlit, 2010) - with Jan Kemp, Bob Orr & Richard von Sturmer - at Auckland University. 2009 - (17 November) Judge (with Jo Emeney) of inaugural $2500 Kathleen Grattan Award for a Sequence of Poems at the International Writers’ Workshop, Northcote. 2009 - (18 October) Poetry reading to celebrate the publication of JAFA [Just Another fantastic Anthology: Auckland in Poetry], with Siobhan Harvey, Stephanie Johnson, Bob Orr, Alistair Paterson, & Iain Sharp, with MC Stu Bagby – at Auckland Art Gallery . 2009 - (24 July) Reading for Poetry Day - with Stu Bagby et al. – at East Coast Bays Public Library, Browns Bay. 2009 - (5 July) Reading & Booklaunch for Jen Crawford's Napoleon Swings (Soapbox Press) - with Sarah Broom, Tony Green, Scott Hamilton, Thérèse Lloyd, Olivia Macassey & Lee Posna – at Galbraith's Alehouse, Central Auckland. 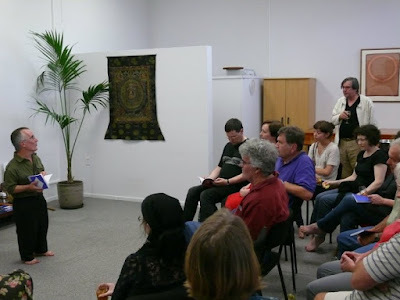 2009 - (18 June) Rhythm & Verse Reading, with Raewyn Alexander, David Eggleton, Rachael Heinmann, & musicians Fiona McEwen & Steve Terry, & Anna Rugis – with MC Ila Selwyn, at Lopdell House, Titirangi. 2009 - (27 May) Lounge #8 Reading, with Suraya Dewing, Murray Edmond, Lynn Hall, Di Nash, Lisa Samuels, Alex Taylor, Alex Walls & Emily Wright – with MC Michele Leggott, at Old Government House, Auckland University. Prize giveaway of a copy of Titus Book's EMO and one of AUP’s Mirabile Dictu (AUP). 2009 - (1 May) Guest Reader (with Richard Wasley) at St. Leonard's Church, Matakana Valley Rd. 2009 - (1 April) MC of 139.123: Creative Writing Poetry Reading at Massey Albany, with Sarah Broom, Jen Crawford, Thérèse Lloyd, Lee Posna & Michael Steven. 2009 - (19 February) Reading in the Summer Poetry at Grey Lynn evening in Grey Lynn Library with Thérèse Lloyd, Lee Posna & Michael Steven. 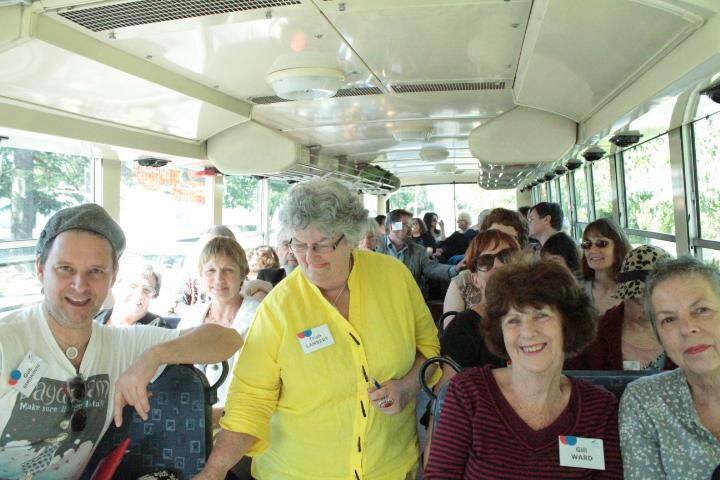 2009 - (12 February) Reading - with Paula Green, Bronwyn Lloyd & Olivia Macassey - at the opening of the Len Castle exhibition Mountain to the Sea, curated by Tanya Wilkinson, at the Lopdell House gallery, Titirangi. 2009 - (17 January) MC at the civil union of Scott Hamilton & Cerian Wagstaff at Nikau Cave, Waikaretu. 2008 - (11 October) Talk and reading (from The Puppet Oresteia) at North Shore Writers’ Group in the Belmont Rose Centre. 2008 - (29 August) Jack Ross launches Martin Edmond’s The Big O b/w Providence (Auckland: Soapbox Press, 2008) at the Biology Department, Auckland University. 2008 - (28 August) Jack Ross mc’s Martin Edmond reading from The Evolution of Mirrors (Queensland: Otoliths Press, 2008) in the Atrium Common Room, School of Social and Cultural Studies, Massey University. 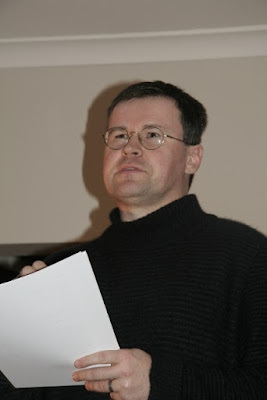 2008 - (17 August) Interviewed by Lynn Freeman for Radio New Zealand’s Arts on Sunday about New New Zealand Poets in Performance (AUP, 2008). 2008 - (5 August) Reading from The Puppet Oresteia at Poetry Live, Classic Comedy Club, Queen Street, Auckland (MC: Christian Jensen). 2008 - (19 July) Winter Warmers - A bumper feast of poetry and song (Art Lounge, New Gallery, Lorne St): Poetry and song from Anna Rugis and Jack Ross following the strands of her recently-released album Traffic in Gold and his new novel EMO (Titus Books, 2008). These poems woven through songs speak of the solitary experience of exile and the way feelings and ideas are recorded in word and song to be "read" in another time. Jen Crawford will read from her latest collection, bad appendix, also published by Titus books, as well as new poems from a new collection in preparation. Linn Lorkin and Hershal Herscher, two of Auckland's best loved musicians, will team with Anna Rugis to present and discuss songs from their show focussing on the French chanson tradition. 2008 - (18 July) Montana Poetry Day: Poetry Central 08. Dual Booklaunch of New NZ Poets in Performance, ed. Jack Ross & Jan Kemp, and Bob Orr’s Calypso (AUP) MC’ed by Michele Leggott, with readings by Thérèse Lloyd, Jack Ross, Tracey Slaughter, Sonja Yelich et al. 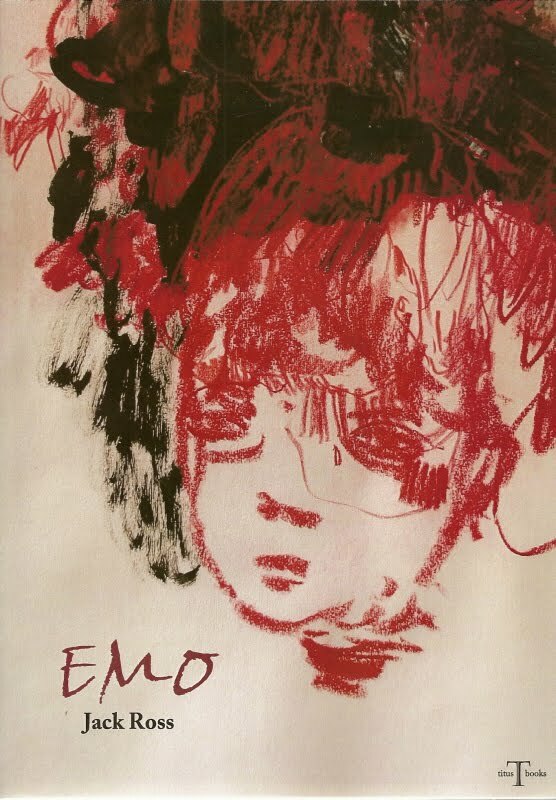 2008 - (19 June) Jen Crawford launches EMO, with a reading by Jack Ross and Bronwyn Lloyd, Jack Ross launches bad appendix, with a reading by Jen Crawford, Bill Direen launches Enclosures, with music from Andrew McCully, MC’ed by Scott Hamilton. Titus Books Launch at the Alleluya Café, St Kevin’s Arcade, Karangahape Rd. 2008 - (26 March) Lounge #1 Reading, with Rosetta Allan, Helena Dunn, Rowan French, Bernard Griffen, Joanna Grochowicz, Tim Heath, Dena Pezet, Chris Price, Kirsten Warner – with MC Michele Leggott, at Old Government House, Auckland University. Prize giveaway of a copy of Pania Press’s Orange Roughy and one of Stu Bagby’s A Good Handful (AUP). 2008 - (9 March) Orange Roughy: Poems & Stories for Tazey, ed. Bronwyn Lloyd & Jack Ross (Auckland: Pania Press) is launched by Michele Leggott, with a message of thanks from Thérèse Lloyd read out by her sister. 2008 - (23 February) “I Say Te Mata” Reading at the Hawke’s Bay Opera House with Michele Leggott and Keith Thorsen (MCs), Murray Edmond, Brian Flaherty, Paula Green, Rowley Habib, Selina Tusitala Marsh, Elizabeth Smither & Helen Sword, plus four student poets: Sonya Clark, Nic Harry, Sue Mun Huang & Jessie Macnell. 2007 - (27 November) Introducing Gabriel White’s Aucklantis at a screening in the Wine Cellar, St. Kevin’s Arcade, Karangahape Rd. 2007 - (10 November) Talk and reading (from Papyri) at North Shore Writers’ Group in the Belmont Rose Centre. 2007 - (27 July) Montana Poetry Day: Poetry Central. Dual Booklaunch of Contemporary NZ Poets in Performance, ed. Jack Ross & Jan Kemp, and Fiona Farrell’s The Pop-up Book of Invasions (both AUP) by Elizabeth Caffin, MC’ed by Iain Sharp, with readings by Fiona Farrell, Jan Kemp, Michele Leggott, Jack Ross, Bob Orr, Janet Charman, Martin Edmond, Richard von Sturmer, Cilla McQueen and others, together with announcement of the results of the Great NZ Digipoem competition. 2007 - (2 July) Titus Books reading at the King’s Arms Pub in Newton, with Bill Direen, Brett Cross, Olwyn Stewart, David Lyndon Brown, Scott Hamilton, Richard Taylor, Mike Johnson, Michael P Steven and Jack Ross, including bands Juan los Bastardos and the Blue Wheel Filters. 2007 - (13 June) Scott Hamilton launches To Terezín, by Jack Ross, and Dr Graeme Macrae launches Blood Ties with Strangers, by Julee Browning, MCed by A/Prof Peter Lineham, at Bennetts Bookshop, Albany Campus, Massey University. 2007 - (17 May) Performed "An Elizabethan: nine letters in the name of poetry," by Elizabeth Smither, Paula Green, Murray Edmond, Michele Leggott, Janet Charman, Brian Flaherty, Sue Fitchett, Selina Tusitala Marsh & Jack Ross, in honour of the retirement of Elizabeth Caffin from AUP, at the Gus Fisher Gallery, Shortland St, Auckland. 2007 - (3 April) Guest poet at Poetry Live, Classic Studio, 321 Queen Street. 2007 - (16 March) Reading at Light the Dark – a fundraising event for Amnesty International, featuring: Elizabeth McRae, Alistair Paterson, Jan Kemp, Jack Ross, Philip Khouri, Riemke Ensing, Burundian Drummers, Yuko Takahashi, Setsuko Strang, Anna Rugis, Richard Green, Jeannette Miller, Ferne Rajanayagam and Ahmed Zaoui. MC: Iain Sharp At St Luke’s Church, 130 Remuera Road. 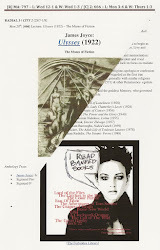 2006 - (5 December) Reading at the launch, by Prof. Peter Lineham, of Gothic NZ: The Darker side of Kiwi Culture, ed. Misha Kavka, Jennifer Lawn & Mary Paul, at Bennetts Bookshop, Albany Campus, Massey University. 2006 - (18 November) Summertime Reading in the Vineyard – with Brendon Wright, Greg Fletcher, Kelly Ana Morey, Tony & Jenny Enderby; music by Vaughan Morgan & Nadine Dempster – MC: Lucy Duffield, at Heron’s Flight Café, Matakana. 2006 - (31 October) Celebration, for North Shore Heritage Week, of Golden Weather: North Shore Writers Past & Present, ed. Jack Ross and Graeme Lay, chaired by Christine Cole Catley, Jack Ross & Helen Woodhouse, at the Takapuna Public Library. Readers included Lee Dowrick, Alice Hooton, David Howard, Jan Kemp and Jacqueline Crompton Ottaway. 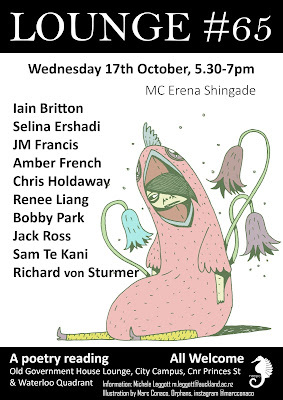 2006 - (17 October) Strata #10 Reading, with Paula Green, Matthew Hutching, Kayt Lackie, Amanda Lyons, Amy McDaid, John MacKinven, Emily Perkins, & Richard von Sturmer – MC: Lisa Samuels, at the Strata Café, Auckland University. 2006 - (21 July) 6.00-8.00 pm: Bluffing Auckland 06 – Poetry and wine in the Auckland Central Library’s new Ian Athfield-designed café at twilight as the downtown lights come on with Cilla McQueen and Anne Kennedy, with Auckland Bluffers Hilary Chung, Murray Edmond, Brian Flaherty, Paula Green, Alison Hunt, Michele Leggott, Bronwyn Lloyd, Selina Tusitala Marsh, Jack Ross, Helen Sword and Lisa Williams. 2006 - (21 July) 12.30-1.30: Roadworks & Cross-sections: Midday reading, with Anna Rugis, at the Auckland Art Gallery, for Montana Poetry Day. 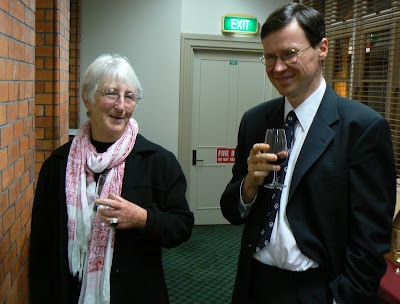 2006 - (20 July) Launch of Classic New Zealand Poets in Performance, edited by Jack Ross & Jan Kemp, published by AUP. 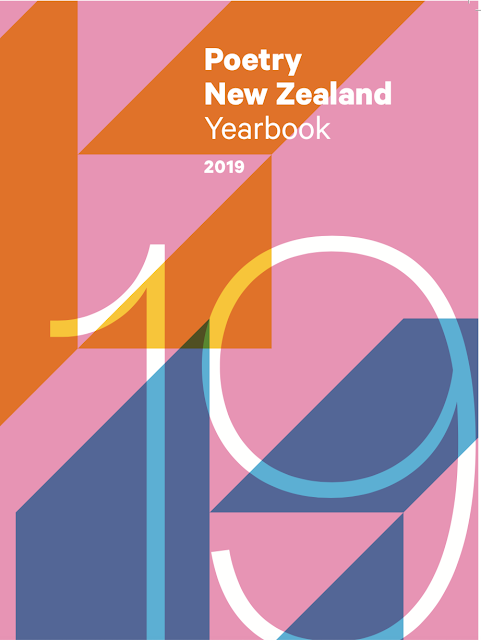 "Classic New Zealand poets attending include C. K. Stead, Riemke Ensing, Jack Ross and Anne Kennedy (a finalist in this year's Poetry category of the Montana New Zealand Book Awards)." 2006 - (24 June) MC, with Ron Pretty, of meeting of North Shore Branch of Society of Authors / P.E.N. 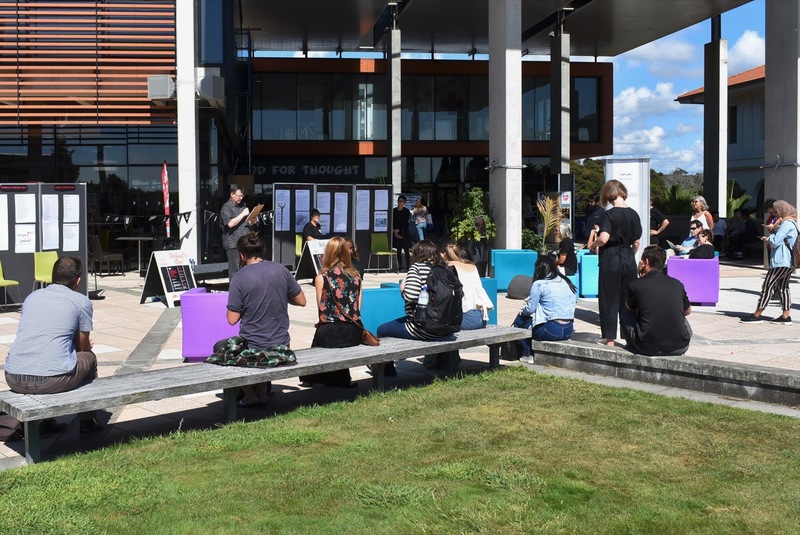 : New Poets XI: New Zealand Tour – Nathan Curnow, Ross Gillett, Francesca Haig, Gita Mammen, Ali Jane Smith & Kate Waterhouse (Massey @ Albany / Atrium Common-room). 2006 - (15 June) Launch, by Gabriel White & Scott Hamilton, of The Imaginary Museum of Atlantis, by Jack Ross & Song of the Brakeman, by William Direen, published by Brett Cross’s Titus Books, at the University of Auckland English Department Common Room. 2006 - (6 June) Guest poet at Poetry Live, Grand Central Bar, Ponsonby Rd. 2006 - (23 April) Poetry Reading (Rakiura: Oban Community Centre) at the Bluff 06 Poetry Symposium, organised by David Howard, Michele Leggott, Cilla McQueen & Brian Flaherty. 2006 - (9 April) Poets’ Paradiso Reading at the Depot, Devonport, with Karyn Hay, Kevin Ireland, Sonja Yelich & Maree Scarlett (MC), music by Mahuia Bridgman-Cooper. 2005 - (8 October) Talk and reading (from To Terezin) at North Shore Writers’ Group in the Belmont Rose Centre. 2005 - (26 August) Strata #2 Reading, with Betsy Pantazelos, David Scott, Karlo Mila, Kate Newburgh, Mike Johnson, Paula Green, Rachel O’Neill, Richarquis de Sade, and Tanielu de Mollard – with MC Michele Leggott, at the Strata Café, Auckland University (launching nzepc Joanna Paul feature). 2005 - (22 July) Alternations of Darkness and Light: Midday reading, with Anna Rugis, at the Auckland Art Gallery, for Montana Poetry Day. 2005 - (21 May) Launch, by Mike Johnson, of Trouble in Mind, by Jack Ross, Curriculum Vitae, by Olwyn Stewart, and Coma, by William Direen published by Brett Cross’s Titus Books, at Shanghai Lil’s Bar, corner of Anzac Rd and Customs St.
2005 - (13 April) Celebration, at the Browns Bay Public Library, of Golden Weather: North Shore Writers Past & Present, ed. Jack Ross and Graeme Lay, published by Christine Cole Catley, with Helen Woodhouse, Alice Hooton, Stu Bagby. 2004 - (24 October) Launch, by Roger Horrocks, of Monkey Miss Her Now, by Jack Ross, published by Raewyn Alexander’s Danger Publishing, at the George Fraser Gallery, University of Auckland. 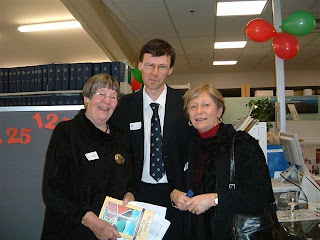 2004 - (8 October) Launch, at the Devonport Public Library, of Golden Weather: North Shore Writers Past & Present, ed. Jack Ross and Graeme Lay, published by Christine Cole Catley, with Lee Dowrick, Riemke Ensing, Alice Hooton, Kevin Ireland, Shonagh Koea, Sonja Yelich. 2004 - (19 September) Launch by George Wood, Mayor of North Shore, of Golden Weather: North Shore Writers Past & Present, ed. Jack Ross and Graeme Lay, published by Christine Cole Catley, at the Takapuna Public Library. 2004 - (12 September) Launch / celebration, with Jan Kemp, of Aotearoa / New Zealand Poetry Sound Archive at the Titirangi Pioneer Hall, Auckland: introducing readers C K Stead, Janet Charman, Stu Bagby, Riemke Ensing, Mike Johnson, Paula Green, Bob Orr , Sonja Yelich. 2004 - (17 August) Judge of International Writers’ Workshop Haiku Competition at the Senior Citizens’ Rooms, 119 Queen St, Northcote. 2004 - (17 July) Launch, with Jan Kemp, Olivia Macassey, and Richard von Sturmer of nzepc feature: 12 Taonga from the Aotearoa / New Zealand Poetry Sound Archive at the Gus Fisher Gallery, Shortland St, Auckland. 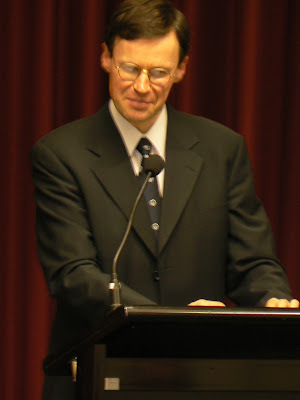 2004 - (16 July) One of thirteen invited readers at the nzepc 3rd Birthday Gala reading, mc’ed by Roger Horrocks and Hilary Chung, Gus Fisher Gallery, Shortland St, Auckland. 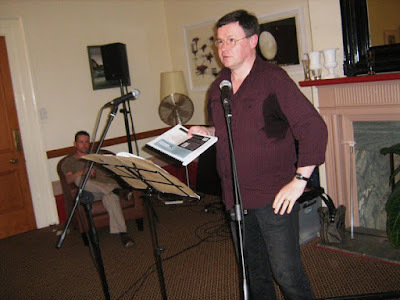 2004 - (27 June) Reading in Mark Pirie’s / Michael O’Leary’s Tupelo Hotel Winter Readings, Wellington. 2004 - (15 June) “Bonfires in the Night:” An Amazing A-Z Poetry & Music Fundraising Marathon for Amnesty International & the Ahmed Zaoui Campaign at the Music School Auditorium, Symonds St.
2004 - (26 March) Filmed by Darcy Lange for a series of half-hour documentaries on poets – including Kevin Ireland, Rosemary Menzies, Alistair Paterson & Denys Trussell – for Triangle TV. 2004 - (2 March) Reading (with Chris Cole Catley & Graeme Lay) at Devonport Arts Festival, Devonport Yacht Club, King Edward Parade, Devonport. 2003 - (19 August) Guest poet at Poetry Live, Grand Central Bar, Ponsonby Rd. 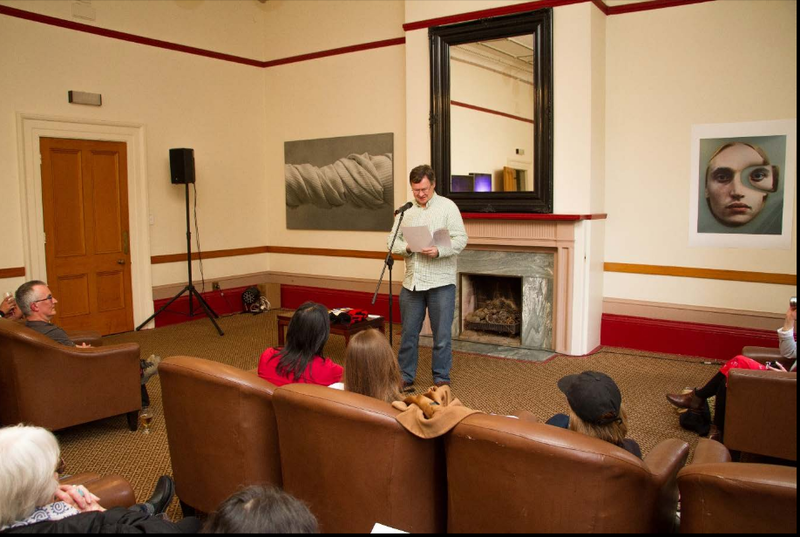 2003 - (2 June) Celebration of Performing Arts: Poetry Readings presented by Poetry Live [12 readers: 12-2 p.m.] in the Auckland Town Hall Reception Room. 2003 - (24 April) Canterbury Poets’ Collective “Poetry in Performance” Reading [with Sugu Pillay] at the Madras Street Café / Bookshop, Christchurch. 2002 - (6 December) Reading at Celebrating Alan Brunton concert at the Auckland University Marae, Symonds St.
2002 - (10 November) Alistair Paterson launches Chantal’s Book (Wellington: HeadworX Publishers) in the Birdcage Tavern, 133 Franklin Rd, Ponsonby. 2002 - (16 September) Recording for SCAPA Sound Archive. 2002 - (13 August) Judge of International Writers’ Workshop Haiku Competition at the Methodist City Mission. 2002 - (11 July) Reading at Poetry Live, The Departure Lounge, Karangahape Rd for Montana National Poetry Day. 2002 - (23 May) Poetry Reading for Amnesty International at the Music School Auditorium, Symonds St.
2002 - (16 April) Guest poet at Poetry Live, The Departure Lounge, Karangahape Rd. 2002 - (14 March) “Green Umbrellas & Folding Chairs.” Bookshop Poets’ Poetry Reading at the Depot, for the Devonport Arts Festival. 2001 - (23 October) M.C. at Poetry Live, [Jill Chan Guest Poet] The Departure Lounge, Karangahape Rd. 2001 - (11 September) Guest poet (with Stu Bagby) at Borders Bookshop. 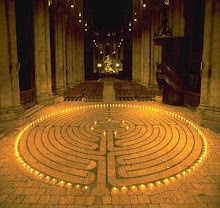 2001 - (21 August) M.C. at Poetry Live, [Lee Dowrick & Wensley Willcox Guest Poets] Speakers’ Corner, corner Howe Street and Karangahape Rd. 2001 - (24 July) M.C. at Poetry Live, [Jan Kemp Guest Poet] Sweet Beats Café, corner Howe Street and Karangahape Rd. 2001 - (13 March) Guest poet at Poetry Live, Sweet Beats Café, corner Howe Street and Karangahape Rd. 2000 - (14 December) Alan Brunton launches Nights with Giordano Bruno (Wellington: Bumper Books), together with Sally Rodwell’s Gonne Strange Charity, at The Space, 146 Riddiford Street, Newtown, Wellington. 2000 - (10 December) Professor D. I. B. Smith launches Nights with Giordano Bruno (Wellington: Bumper Books) in the garden of 6 Hastings Rd, Mairangi Bay. 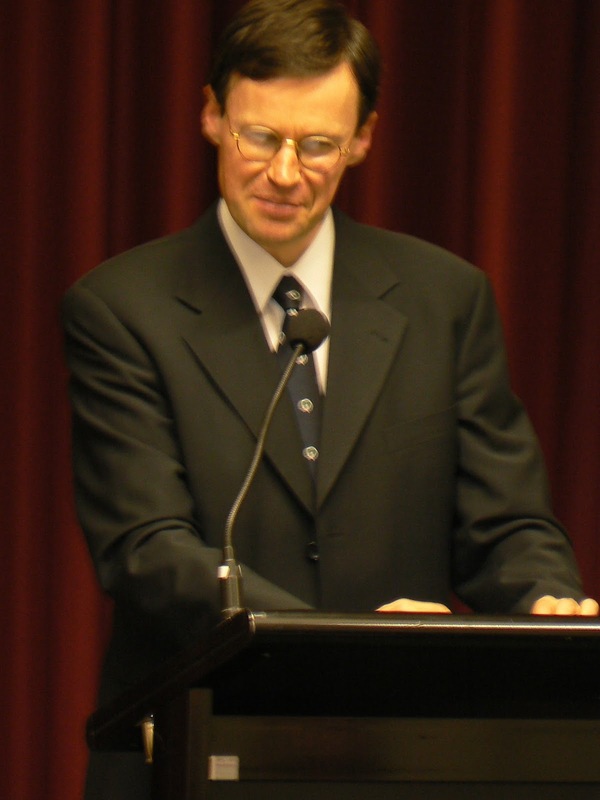 2000 - (13 October) Judge of the Sam Hunt Literary Scholarship, St. Peter’s College, Auckland. 2000 - (1 October) Book-launch of A Town Like Parataxis, text by Jack Ross, photos by Gabriel White (Auckland: Perdrix Press) at 23 Maxwell Ave, Westmere. 2000 - (30 September) Guest Poet at Live Poets Café, Karangahape Rd. 1999 - (26 October) Guest poet at the Depot Poetry Readings, The Depot, Devonport. 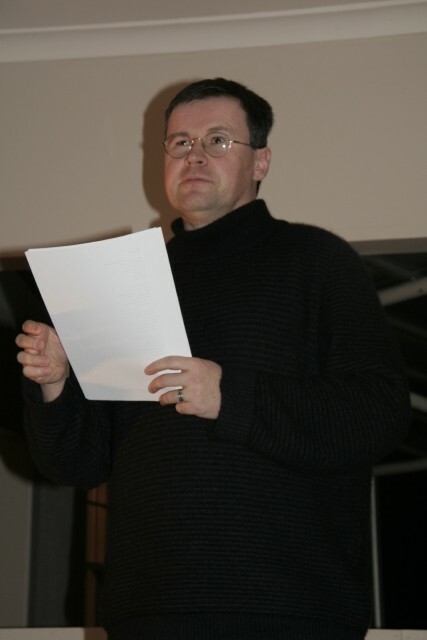 1999 - (19 September) Poetry Reading at the Royal NZ Yacht Squadron, Westhaven. 1999 - (14 September) Judge of International Writers’ Workshop Tanka Competition at the Methodist City Mission. 1999 - (16 July) Participation in National Poetry Day at Takapuna Library, organised by Lee Dowrick and Helen Woodhouse, with the Assistance of Montana New Zealand Book Awards and Creative New Zealand. 1999 - (8 April) Canterbury Poets’ Collective “Poetry in Performance” Reading [with Sarah Quigley, Joanna Margaret Paul, and John Weir] at the WEA Centre, 59 Gloucester St, Christchurch. 1999 - (8 March) “Salt of the Earth.” Bookshop Poets’ Poetry Reading at the Bunker, for the Devonport Arts Festival. 1998 - (7 November) Devonport Festival Poets Reading at the NZ Garden Sculpture and Outdoor Art Exhibition, on behalf of the North Shore Women’s Refuge, Becroft Garden, 9 Lakeview Rd, Takapuna. 1998 - (4 November) Guest poet at Poetry Live, Alleluya Café, St. Kevin’s Arcade, Karangahape Rd. 1998 - (25 September) Theresia Marshall launches City of Strange Brunettes (Auckland: Pohutukawa Press), together with Lee Dowrick’s That was Then, at the Takapuna Public Library. 1998 - ((11 August) Judge of International Writers’ Workshop Haiku Competition at the Methodist City Mission. 1998 - (29 March) Poetry Reading at the Trustpower “Into the Light” Poetry Festival (Tauranga) [One of six invited poets, along with Janice M. Bostok, Riemke Ensing, Catherine Mair, Bill Manhire and Brian Turner]. 1998 - (20 March) Bookshop Poets Poetry Reading at the Devonport Arts Festival. 1997 - (16 July) Guest poet at Poetry Live, Alleluya Café, St. Kevin’s Arcade, Karangahape Rd. 1997 - (1 June) Poetry reading at the Poetry Live Queens Birthday Poetry Festival. 1997 - (6 March) Bookshop Poets Poetry Reading at the Devonport Arts Festival. 1991 - (10 August) K. M. Ross gives a ten-minute recitation of Jack Ross’s poetry at Poethon 91: 24 Hours of Memorised Poetry. The Assembly Rooms, Edinburgh.